The Soft Proofing feature is a useful tool for photographers to preview and predict the color and tonal changes that will occur when an image is printed, output to a specific device or converted to a different profile. A new feature in the Proof Setup menu allows you to preview the effects two common types of color blindness have on your image, giving you the ability to see how a color-blind person will view your image. 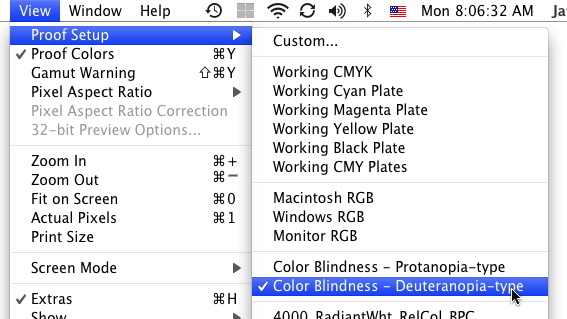 The most obvious use of the Color Blindness proofing is in Web design. To ensure that visitors to your site can read the text against a colored background, previewing your design with the Color Blindness profiles will help identify any problem areas. This is particularly important as more photographers are building their own sites in Photoshop, either to slice up for use in Dreamweaver, or to build the site completely using a tool like Sitegrinder. Ensuring all visitors can access your site is a fundamental component in building an effective Web site. Thanks for your comment. The Soft Proofing feature in Photoshop CS4 is designed for people with standard color vision to simulate the way their designs (or photos) will be viewed by those with color blindness. I’ve worked with a number of photographers with red/green color blindness and helped them color correct their images reliably. What’s most important is to master the use of the Info panel in Photoshop or the RGB color picker in Lightroom. Equal values of RGB will always create a neutral shade of gray. By measuring neutral colors in the image and viewing their RGB values, you can determine what, if any, color cast is present in the photo and adjust accordingly. For a step-by-step color correction tutorial in Lightroom, you might check out the 2nd edition of my book Perfect Digital Photography. To perform these steps in Photoshop, and read a more detailed description of the use of the Info panel for color corrections, you might check out the first edition of my book.